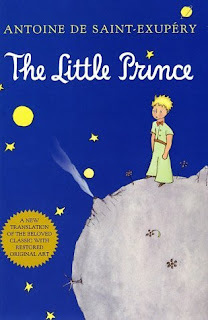 I have vague memories of watching a movie version of The Little Prince in 7th grade and reading bits of it in French class (in French, naturellement). But I'm so glad that I decided to read it again (and in English this time!). It's a lovely, timeless story about a man whose plane crashes in the desert. There, he meets a wise boy from a far away and very tiny planet. No matter what your age, you can enjoy this simple story. It's about what's important life and how, too often, grown-ups forget the important things for money, power, vanity, personal pleasure, and seriousness. The book shows the beauty of a childish mind- free, creative, curious, and determined- the sort of mind everyone should aspire to have, I think.